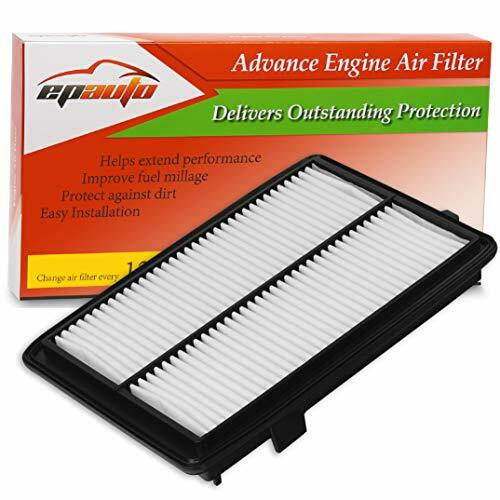 EPAuto FP-038-1 - Suggest replace with cabin Air Filter CP134 CF10134. Protect against dirt. Compatible auto models: Acura: RDX 2013-2018. Epauto engine air filter gp413 compatible model and year list: acura: rdx 2013-2018 cross reference: honda: 17220-r8a-a01 fram: ca11413 carquest: 83211 champ: af5218 hastings: af1599 luber-finer: af5218 mahle: lx3762 napa: 9211 premium guard: pa6276, pa9906 SERVICE CHAMP: AF6276 VALVOLINE: VA-393 WIX: 49211 Helps extend performance. Improve fuel millage, Recommended replacement every 12, 000 miles. Replacement for fram ca11413, replacement Acura Genuine Part # 17220-R8A-A01. EPAuto AUTO-CF-006 - Epauto cabin air filter provides clean air for driver and passengers, contains soda and carbon to generate fresh breeze air. Check for filter replacement if a musty odor emits from the vehicles ventilating system. Replacement for fram cf10134, 80292-swa-a01, honda genuine part # 80292-sda-a01, 80292-sec-a01, 80292-shj-a41, 80292-sdc-a01, 80292-t0g-a01, 80292-TZ5-A41. Compatible auto list: acura: csx 2007-2011, ilx 2013-2018, civic 2006-2015, cr-v 2007-2016, rdx 2007-2018, odyssey 2005-2017, accord crosstour 2010-2011, rlx 2014-2018, tlx 2015-2018, tsx 2004-2014, pilot 2009-2018, tl 2004-2014, mdx gas 2007-2018, rl 2005-2012, zdx 2010-2013; honda: accord 2003-2018, croostour 2012-2015, Ridgeline 2006-2018. CP134 CF10134 Honda & Acura Replacement Premium Cabin Air Filter includes Activated Carbon - Check for filter replacement if the vehicles heating & air conditioning systems exhibits poor performance or efficiency. Recommended replacement every 12 months or 12, 000 miles. Epauto cabin air filter cp134 compatible model and year list: acura: csx 2007-2011, 80292-sec-a01, rdx 2007-2018, rlx 2014-2018, 80292-tz5-a41 fram: cf10134 ac-delco: cf159 baldwin: pa4196 beck/arnley: 042-2019 042-2023 bosch: p3875 champ: caf1781 defense: dc058 delphi: 16458329 g k industries: cf1047 hastings: af1244, cr-v 2007-2016, pilot 2009-2018, tsx 2004-2014, 80292-t0g-a01, zdx 2010-2013 honda: accord 2003-2018, 80292-swa-a01, civic 2006-2015, croostour 2012-2015, odyssey 2005-2017, accord crosstour 2010-2011, rl 2005-2012, tlx 2015-2018, mdx gas 2007-2018, 80292-shj-a41, ridgeline 2006-2018 cross reference: honda: 80292-sda-a01, ilx 2013-2018, 80292-sdc-a01, tl 2004-2014, afc1244 intercontinental auto parts: alc-5302/1 kleener : caf1781 luber-finer: caf1781 napa: 4815 parts master: 94815 pronto: PC-5519 PUROLATOR: C35519 SERVICE PRO: MC35519 STP: CAF1781 WIX: 24815 Epauto cp134 cf10134 honda & acura replacement Premium Cabin Air Filter includes Activated Carbon. Clean air for driver and passengers, contains soda and carbon to generate fresh breeze air. Enhanced hvac performance, Recommended replacement every 12 months or 12, 000 miles. EPAuto FC-011-3 - Replacement for fram cf10134, 80292-sec-a01, 80292-swa-a01, 80292-t0g-a01, 80292-sdc-a01, honda genuine part # 80292-sda-a01, 80292-shj-a41, 80292-TZ5-A41. Compatible auto list: acura: csx 2007-2011, rlx 2014-2018, tlx 2015-2018, rl 2005-2012, tl 2004-2014, rdx 2007-2018, cr-v 2007-2016, odyssey 2005-2017, croostour 2012-2015, zdx 2010-2013; honda: accord 2003-2018, civic 2006-2015, pilot 2009-2018, mdx gas 2007-2018, accord crosstour 2010-2011, ilx 2013-2018, tsx 2004-2014, Ridgeline 2006-2018. Clean air for driver and passengers, contains soda and carbon to generate fresh breeze air. Check for filter replacement if the vehicles heating & air conditioning systems exhibits poor performance or efficiency. Enhanced hvac performance, Recommended replacement every 12 months or 12, 000 miles. Replacement for fram cf10134, 80292-swa-a01, honda genuine part # 80292-sda-a01, 80292-sdc-a01, 80292-t0g-a01, 80292-shj-a41, 80292-sec-a01, 80292-TZ5-A41. 2 Pack - EPAuto CP134 CF10134 Replacement for Honda & Acura Premium Cabin Air Filter includes Activated Carbon - Compatible auto list: acura: csx 2007-2011, mdx gas 2007-2018, odyssey 2005-2017, rl 2005-2012, tsx 2004-2014, cr-v 2007-2016, civic 2006-2015, accord crosstour 2010-2011, tlx 2015-2018, rdx 2007-2018, tl 2004-2014, pilot 2009-2018, ilx 2013-2018, zdx 2010-2013; honda: accord 2003-2018, croostour 2012-2015, RLX 2014-2018, Ridgeline 2006-2018. Epauto cabin air filter cp134 compatible model and year list: acura: csx 2007-2011, ilx 2013-2018, 80292-tz5-a41 fram: cf10134 ac-delco: cf159 baldwin: pa4196 beck/arnley: 042-2019 042-2023 bosch: p3875 champ: caf1781 defense: dc058 delphi: 16458329 g k industries: cf1047 hastings: af1244, 80292-swa-a01, croostour 2012-2015, 80292-sec-a01, mdx gas 2007-2018, pilot 2009-2018, tsx 2004-2014, accord crosstour 2010-2011, 80292-t0g-a01, odyssey 2005-2017, tlx 2015-2018, rl 2005-2012, rdx 2007-2018, 80292-shj-a41, zdx 2010-2013 honda: accord 2003-2018, rlx 2014-2018, ridgeline 2006-2018 cross reference: honda: 80292-sda-a01, civic 2006-2015, cr-v 2007-2016, 80292-sdc-a01, tl 2004-2014, afc1244 intercontinental auto parts: alc-5302/1 kleener : caf1781 luber-finer: caf1781 napa: 4815 parts master: 94815 pronto: PC-5519 PUROLATOR: C35519 SERVICE PRO: MC35519 STP: CAF1781 WIX: 24815 Epauto cp134 cf10134 honda & acura replacement Premium Cabin Air Filter includes Activated Carbon. Ecogard XC35519 - Replacement for fram cf10134, 80292-sec-a01, 80292-swa-a01, 80292-shj-a41, honda genuine part # 80292-sda-a01, 80292-t0g-a01, 80292-sdc-a01, 80292-TZ5-A41. Compatible auto list: acura: csx 2007-2011, rlx 2014-2018, rdx 2007-2018, tl 2004-2014, zdx 2010-2013; honda: accord 2003-2018, tlx 2015-2018, ilx 2013-2018, tsx 2004-2014, pilot 2009-2018, rl 2005-2012, cr-v 2007-2016, accord crosstour 2010-2011, mdx gas 2007-2018, croostour 2012-2015, odyssey 2005-2017, civic 2006-2015, Ridgeline 2006-2018. Clean air for driver and passengers, contains soda and carbon to generate fresh breeze air. Replace per manufacturer recommendations or when existing cabin air filter inhibits airflow. Installs easily with included instructions - only takes a few minutes in most cars. Replaces: fram cf10134 purolator c35519 wix 24815 OE 80292-SDA-A01. ECOGARD XC35519 Premium Cabin Air Filter Fits Honda Accord, Civic, CR-V, Odyssey, Pilot / Acura MDX, TL, TSX, RDX / Honda Ridgeline / Acura TLX, ILX / Honda Crosstour / Acura RL - If your vehicle is exposed to a considerable amount of road debris, ECOGARD recommends changing your cabin air filter once in the Spring and Winter. Custom installation instructions included Improves air quality in your vehicle by 99. 5% all products are designed with the installer in mind Premium filtering efficiency Epauto cp134 cf10134 honda & acura replacement Premium Cabin Air Filter includes Activated Carbon. Kootek AT134 - Ensure fit using ECOGARD's online catalog. Specifically engineered and tested for honda, form, acura oe original equipment cabin air filter's fit, and function. Filters dust and pollen ranging from 5-100 microns to dramatically improving in-vehicle air quality. 28 pleats provide more surface area which helps remove road dust, pollen, small particles more efficiently. Car air filter contains activated carbon and soda helps absorb odors and generate fresh breeze air. Replacement for fram cf10134, 80292-sdc-a01, 80292-shj-a41, 80292-sec-a01, recommended replacement every 12 months or 12, 80292-tz5-a41. Compatible model and year list: Please note these models may not be standard equipment on DX, EX and Base models. Kootek 2 Pack Cabin Air Filter for CF10134 Honda & Acura, Civic, CR-V, Odyssey, CSX, ILX, MDX, RDX, AT134 - Installation: 1. Open the glove compartment 2. Pull the arm free from the glove compartment 3. Press inward on the sides of the glove compartment to disconnect the stops. Enhanced hvac performance, 80292-t0g-a01, honda genuine part # 80292-SDA-A01, 80292-SWA-A01, 000 miles. Close the glove compartment. 4. Slide the filter frame out from the housing 5. EPAuto FC-011-1 - Enhanced hvac performance, Recommended replacement every 12 months or 12, 000 miles. Replacement for fram cf10134, honda genuine part # 80292-sda-a01, 80292-sec-a01, 80292-t0g-a01, 80292-swa-a01, 80292-shj-a41, 80292-sdc-a01, 80292-TZ5-A41. Compatible auto list: acura: csx 2007-2011, cr-v 2007-2016, croostour 2012-2015, ilx 2013-2018, pilot 2009-2018, odyssey 2005-2017, tsx 2004-2014, accord crosstour 2010-2011, rdx 2007-2018, rl 2005-2012, civic 2006-2015, zdx 2010-2013; honda: accord 2003-2018, mdx gas 2007-2018, RLX 2014-2018, tlx 2015-2018, TL 2004-2014, Ridgeline 2006-2018. Compatible with 2003-2017 honda accord, 2004-2014 acura tsx, 2009-2017 honda pilot, 2007-2016 honda cr-v, 2004-2014 acura tl, 2007-2017 acura MDX, 2006-2015 honda civic, 2005-2017 honda odyssey, 2007-2018 acura rdx, 2006-2017 Honda Ridgeline. Removes and filters 99. 5% of all dust, air pollution, allergens, pet dander, pollen, and other airborne contaminants from the outside air before it reaches the vehicle's interior. 3 Pack - EPAuto CP134 CF10134 Replacement for Honda & Acura Premium Cabin Air Filter includes Activated Carbon - Helps prevent premature wear on your car's hvac air conditioning and heating system blower by promoting good airflow inside the car. Epauto cabin air filter cp134 compatible model and year list: acura: csx 2007-2011, 80292-sdc-a01, 80292-tz5-a41 fram: cf10134 ac-delco: cf159 baldwin: pa4196 beck/arnley: 042-2019 042-2023 bosch: p3875 champ: caf1781 defense: dc058 delphi: 16458329 g k industries: cf1047 hastings: af1244, zdx 2010-2013 honda: accord crosstour 2010-2011, 80292-t0g-a01, mdx 2007-2016, rdx 2007-2016, 80292-sec-a01, civic 2006-2015, 80292-shj-a41, cr-v 2007-2016, croostour 2012-2015, tsx 2004-2014, 80292-swa-a01, rl 2005-2012, ilx 2013-2016, pilot 2009-2015, tl 2004-2014, rlx 2014-2016, ridgeline 2006-2014 cross reference: honda: 80292-sda-a01, accord 2003-2016, odyssey 2005-2016, afc1244 intercontinental auto parts: alc-5302/1 kleener : caf1781 luber-finer: caf1781 napa: 4815 parts master: 94815 pronto: pc-5519 PUROLATOR: C35519 SERVICE PRO: MC35519 STP: CAF1781 WIX: 24815 Epauto cp134 cf10134 honda & acura replacement Premium Cabin Air Filter includes Activated Carbon. Bosch 3323 - Note: these models may not be standard equipment on dx, mdx 2007-2016, pilot 2009-2015, ilx 2013-2016, civic 2006-2015, CR-V 2007-2016, RDX 2007-2016, EX and Base models. Clean air for driver and passengers, contains soda and carbon to generate fresh breeze air. Enhanced hvac performance, honda genuine part # 80292-sda-a01, 80292-SWA-A01, 80292-T0G-A01, 000 miles. Bosch premium filtech oil Filter provides superior oil filtration for increased engine protection. Enhanced hvac performance, Recommended replacement every 12 months or 12, 000 miles. Replacement for fram cf10134, 80292-sdc-a01, 80292-shj-a41, 80292-swa-a01, honda genuine part # 80292-sda-a01, 80292-t0g-a01, 80292-sec-a01, 80292-TZ5-A41. Compatible auto list: acura: csx 2007-2011, cr-v 2007-2016, odyssey 2005-2017, rlx 2014-2018, tl 2004-2014, rdx 2007-2018, accord crosstour 2010-2011, pilot 2009-2018, mdx gas 2007-2018, zdx 2010-2013; honda: accord 2003-2018, tsx 2004-2014, rl 2005-2012, tlx 2015-2018, ILX 2013-2018, civic 2006-2015, croostour 2012-2015, Ridgeline 2006-2018. Bosch 3323 Premium FILTECH Oil Filter - Bosch recommends the use of Castrol motor oil. Ensure fit using ECOGARD's online catalog. Specifically engineered and tested for honda, acura oe original equipment cabin air filter's fit, form, and function. Filters dust and pollen ranging from 5-100 microns to dramatically improving in-vehicle air quality. 28 pleats provide more surface area which helps remove road dust, pollen, small particles more efficiently. AmazonBasics AM0D023Q - An amazon brand epauto cp134 cf10134 honda & acura replacement Premium Cabin Air Filter includes Activated Carbon. Clean air for driver and passengers, contains soda and carbon to generate fresh breeze air. Enhanced hvac performance, Recommended replacement every 12 months or 12, 000 miles. Full-synthetic motor oil 0W-20, 5 quart; formulated for longer drain intervals. Replaces: fram cf10134 purolator c35519 wix 24815 OE 80292-SDA-A01. Silicone anti-drainback valve ensures a supply of clean oil when the vehicle is started. Enhanced hvac performance, honda genuine part # 80292-sda-a01, 80292-SWA-A01, 80292-T0G-A01, 000 miles. Compatible auto list: acura: csx 2007-2011, rlx 2014-2016, rl 2005-2012, odyssey 2005-2016, zdx 2010-2013; honda: accord crosstour 2010-2011, tl 2004-2014, accord 2003-2016, tsx 2004-2014, croostour 2012-2015, ridgeline 2006-2014. AmazonBasics Full Synthetic Motor Oil SN Plus, dexos1-Gen2 - 0W-20 - 5 Quart - Replace per manufacturer recommendations or when existing cabin air filter inhibits airflow. Installs easily with included instructions - only takes a few minutes in most cars. Note: these models may not be standard equipment on dx, civic 2006-2015, cr-v 2007-2016, mdx 2007-2016, Pilot 2009-2015, ilx 2013-2016, RDX 2007-2016, EX and Base models. Clean air for driver and passengers, contains soda and carbon to generate fresh breeze air. Exclusive filtech media technology screens out more harmful contaminants for greater engine protection. Potauto MAP 1003C - 3 increase safety through reduced deposits in the fan or on the windscreen, and protect HVAC air conditioning performance. Competitor cross reference part numbers for reference only, service pro mc35519, g k industries cf1047, wix 24815, atp ha-5，tyc 800003p, 80292-t0g-a01, hastings af1244, 80292-sec-a01, k&n vf2001, please check size: ac-delco cf159, kleener caf1781, beck/arnley 042-2019, 80292-swa-a01, parts master 94815, mann mc 1008, 80292-shj-a41, PUROLATOR C35519, stp caf1781, 80292-TZ5-A41, bosch p3875, 80292-sdc-a01, baldwin pa4196, 042-2023, honda 80292-sda-a01, luber-finer caf1781, FRAM CF10134. Change filter every 12 months or 12, or weak air volume. 2. Check & replace filter if peculiar smell / odors emit from the cabin air outlets. Compatible auto list: acura: csx 2007-2011, tsx 2004-2014, zdx 2010-2013; honda: accord crosstour 2010-2011, croostour 2012-2015, rl 2005-2012, tl 2004-2014, accord 2003-2016, rlx 2014-2016, odyssey 2005-2016, ridgeline 2006-2014. POTAUTO MAP 1003C CF10134 Activated Carbon Car Cabin Air Filter Replacement for ACURA, CSX, ILX, RL, RLX, TL, TSX, ZDX, MDX, RDX, HONDA, Accord, Civic, Crosstour, CR-V, Odyssey, Pilot, Ridgeline - 3. Enhancing the heating, Ventilation and Air Conditioning HVAC efficiency. High resistance to viscosity and thermal breakdown. Why to replace / upgrade with Potauto? 1. Reducing at least 98% of these contaminants Dust, Exhaust Gas, Bacteria, Pollen, Particles of 5-100 microns. Potauto B00WLEGDXQ - 5 2005-2017 pilot V6 3. 5 2007-2014 tl v6 3. Map 1003w cabin filter fits: Acura CSX L4 2. Replacement for fram cf10134, 80292-sdc-a01, 80292-shj-a41, 80292-t0g-a01, 80292-sec-a01, 80292-swa-a01, honda genuine part # 80292-sda-a01, 80292-TZ5-A41. Compatible auto list: acura: csx 2007-2011, ilx 2013-2018, tsx 2004-2014, rlx 2014-2018, odyssey 2005-2017, rl 2005-2012, tlx 2015-2018, zdx 2010-2013; honda: accord 2003-2018, tl 2004-2014, accord crosstour 2010-2011, rdx 2007-2018, croostour 2012-2015, mdx gas 2007-2018, Pilot 2009-2018, cr-v 2007-2016, civic 2006-2015, Ridgeline 2006-2018. Clean air for driver and passengers, contains soda and carbon to generate fresh breeze air. 4 2003-2017 accord V6 3. 0 2017-2018 mdx v6 3. 5 2008-2017 accord cross tour V6 3. 3 2007-2012 rdx v6 3. 5 2013-2018 rl v6 3. From the air passing through the filter & entering the interior of the vehicle. Ensure fit using ECOGARD's online catalog. POTAUTO MAP 1003W CF10134 High Performance Car Cabin Air Filter Replacement for ACURA, CSX, ILX, RL, RLX, TL, TSX, ZDX, MDX, RDX, HONDA, Accord, Civic, Crosstour, CR-V, Odyssey, Pilot, Ridgeline - Specifically engineered and tested for honda, acura oe original equipment cabin air filter's fit, form, and function. Filters dust and pollen ranging from 5-100 microns to dramatically improving in-vehicle air quality. 28 pleats provide more surface area which helps remove road dust, pollen, small particles more efficiently. FRAM CF10134 - Check & model Numbers remain the property of their respective owners. Spec. 9. 29" length, 8. 78" width, 1. 18" height; three-layer fabric ; Installation instructions included. Applications where used: acura csx 11-07, odyssey 17-05, accord crosstour 10-11, rlx 18-14, tlx 19-15, rl 12-05, tsx 14-04, crosstour 15-12, cr-v 16-07, ilx 18-13, pilot 18-09, zdx 13-10; honda accord 18-03, mdx 18-07, civic 15-06, rdx 18-07, TL 14-04, Ridgeline 18-06 See Amazon Part Finder for fitments to your cars. Benefits: 1 reducing at least 98% of these contaminants dust, exhaust gas, pollen, particles of 5-100 microns. Etc. Replacement for fram cf10134, 80292-sec-a01, 80292-t0g-a01, 80292-shj-a41, honda genuine part # 80292-sda-a01, 80292-sdc-a01, 80292-SWA-A01, 80292-TZ5-A41. Compatible auto list: acura: csx 2007-2011, odyssey 2005-2017, ilx 2013-2018, tlx 2015-2018, accord crosstour 2010-2011, cr-v 2007-2016, civic 2006-2015, zdx 2010-2013; honda: accord 2003-2018, tsx 2004-2014, mdx gas 2007-2018, rlx 2014-2018, tl 2004-2014, rl 2005-2012, rdx 2007-2018, croostour 2012-2015, Pilot 2009-2018, Ridgeline 2006-2018. FRAM CF10134 Cabin Air Filter - Clean air for driver and passengers, contains soda and carbon to generate fresh breeze air. Ensure fit using ECOGARD's online catalog. Specifically engineered and tested for honda, form, acura oe original equipment cabin air filter's fit, and function. Filters dust and pollen ranging from 5-100 microns to dramatically improving in-vehicle air quality.